HuiZhou FuLiYuan Machinery Company is very professional manufacturer to make epe foam machines, pe film machines, ps foam machine, xpe foam machine, etc. More 10000 m2. Customers more than 50 countries. Our Brand FuLiYuan, FLY is famous in plastic field. 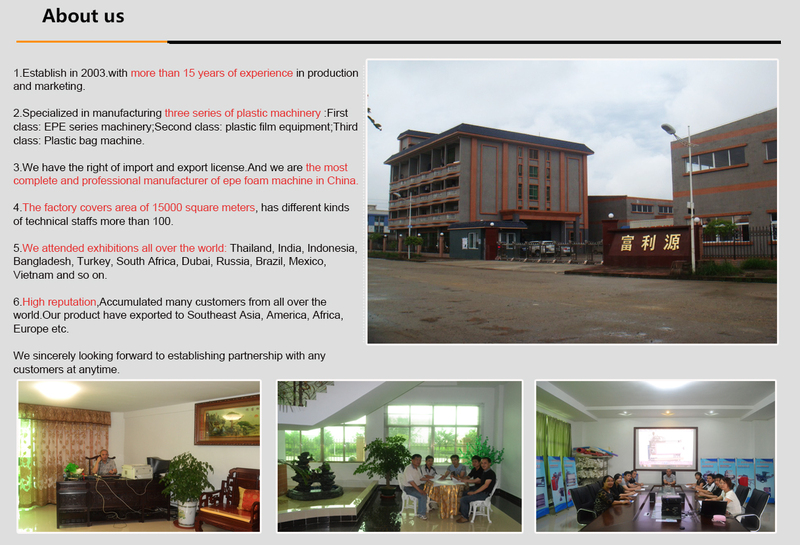 HuiZhou FuLiYuan Machinery Co., Ltd. located in HuiZhou,China. With our own land and factory building about 15000m2. FLY (FuLiYuan machinery) brand more than 10 years. Our machines have solde to more than 50 countries all over the world. We have export liscense, can export machines directly, also many of the agent help us to export machine to many countries. Our old factory in DongGuang city, GuangDong province, we enlarged and moved to HuiZhou city in 2012. FLY brand not changed. The customers remember our company well, they say FLY like birds fly. FLY can fly all over the world, and can fly higher, and better. First Class: PE foam series machinery, PE foam series machinery, FLY75-200 PE foam extrusion machine, including PE foam sheet extrusion machine, PE foam stick, V type, U type, pipe extrusion machine etc. PE foam fruit net extrusion machine, PE foam sheet bonding machine/PE foam sheet thickening machine, PE foam sheet coating machine, PE foam vertical cutting machine, 4-pole hydraulic cutting machine, hot melt glue machine, PE foam sheet auto-cutting machine, PE foam bag making machine, PE foam recycling machine, etc. Second Class: PS double-stage two screws extrusion machine, PS foam recycling machine, etc. Third Class: PE film series, FLY500, FLY1000, FLY1500 automatic single/double/three layers PE stretch film extrusion machine, PE on-line recycling machine, PE film/cling film cutting and rewinding machine, PE single or multi-layer co-extrusion blowing machine, multi-color plastic film printing machine, plastic extrusion machine, etc.